Who Knew Racism Sells Skin Care Products? 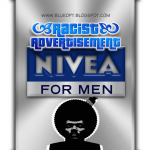 The well known skin care company Nivea has a line of very popular men’s care grooming products available. I’ve used their shower gel for almost a year now, and I’ve even recommended it to friends when they ask me why do I smell so good when I get out of the shower. I like it because it has a mild yet pleasant masculine sent that isn’t overpowering like some of the other shower gels aimed at men. It lathers well, and it’s reasonably priced. So when I saw their new print ad campaign, I was shocked , disappointed and somewhat confused. The ad depicts a very well dressed clean cut African American man holding the decapitated head of another African American man who has an afro and a beard with a scowling almost menacing facial expression, with the catchphrase “RE-CIVILIZE YOURSELF and LOOK LIKE YOU GIVE A DAMN” prominently displayed in the center of the ad. But the abundance of offensive stereotypes didn’t end there… to top it all off they have the clean cut African-American head chopper posing on a football field… yes, a football field. 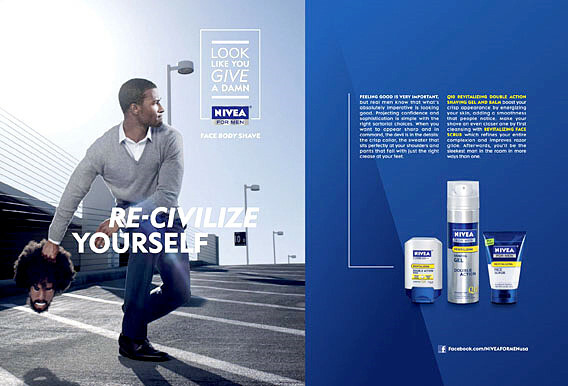 According to Nivea’s brand messaging, Black men are inherently uncivilized and can only become civilized if they forsake what comes out of their hair follicles naturally and adopt a more European look. But, have no fear, Nivea will come to our rescue and saves us from savagery by getting rid of our “unacceptable” wool like coarsely textured NATURAL fro to make our appearance more like our “civilized” Caucasian counterparts. Unfortunately to some people this ad and anything like it will never click for them as being racist. I have some of the most open-minded progressive thinking (white) friends, and I know a couple of them would never see the racism in this ad no matter how eloquent and descriptive I made my explanation. This use to bother and frustrate me like nothing else until I had one of Oprah’s “ah-ha moments” (lol don’t we all miss Oprah). My friends weren’t purposely refusing to see racism, or purposely ignoring things with racist connotations… they weren’t doing that at all. When they look at me and other minorities, they were looking at us without any historical context. They saw me and other African-Americans the same way they saw themselves. Not figuratively or metaphorically… but they actually saw no difference. So when stories like this would pop up, they would judge it by putting themselves in the situation and base an opinion on how they would feel or react. They wouldn’t understand or see the racism. Like the hair issue with this ad. It’s saying that African-American hair in its natural form is uncivilized, and the racism there is pretty clear to me. Sure there are degrees of racism, but racism of any kind big or small should not be tolerated by anyone who believes in equality. So my advice to those who are white and have a problem with understanding how things like this could be seen as racist would be this: If you have a close African-American friend who you respect and trust to always tell you the truth, and you believe them to be rational thinkers in every aspect of their lives, and they confide in you that they are offended by something because they found it to be insulting and racist… BELIEVE THEM. They have experienced all types of discrimination and racism throughout the course of their lives, so why not trust that this friend is better equipped to recognize this when it happens. Being flippant or dismissive about it is hurtful and it shows your trustworthy respectably friend that you in-fact do not trust their judgement (which more than likely came from painful real-life experiences of racism against them). I know this is not your intention because you see life from a totally different perspective, but the next time something like this occurs and you’re discussing it with an African-American friend, please keep this in mind.